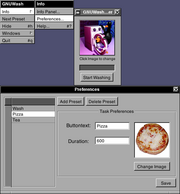 GNUWash is a simple timer that reminds you when your pizza, tea or laundry is done. This page was last modified 17:03, 21 February 2019. This page has been accessed 20,246 times.